Battery Park City located in lower Manhattan, surrounded by the Hudson River, on one side and West Street on the other and Rockefeller Park, West and Wagner Park to the east. Battery Park City is leased by the city so you do not pay real estate taxes, instead property owners in Battery Park City New York pay what is called Pilot payment in lieu of taxes. The common charges and Pilot varies from building to building depending on when the buildings were built how long the land lease is. Battery Park History was born out of residents wanting to live where they work in the early 1970's when the original World Trade Center was being built. Since the World Financial Centers and the Manhattan Mercantile Exchange are here, it stands to reason that convenient homes and apartments would be here as well. From the tip of Manhattan and Wagner Park entrance of the Statue of Liberty to Rockefeller Park at the far north end, Battery Park is in its own little world. Beautifully cared for by the Battery Park City Authority. With over 9,000 residents 3 public schools including Stuyvesant High School on Chamber Street, P.S. #89 Elementary School on Warren St. I.S.#289 is the Junior or Intermediate public school in Battery Park. Both are located at 201 Warren Street. 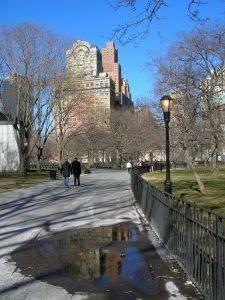 Battery Park City is a leader in Green. An apartment building called the Solaira, built in 2003 is said to be one of the greenest places to live in the United States. The water is filtered, the air is double filtered, the beautiful flooring used in the apartments are made from the end use of wood made for other reasons, so no trees were specifically cut down. The wood for the cabinets has been taken from green conscious logging companies. Soon all of Battery Park will be green. In 2009 all non- residential buildings will have to be up to code with the L.E.A.D.S. an organization created by the US government. Battery Park City Park Conservancy is a not for profit organization taking care of all the ball fields, park benches, hard-scape and landscape in the more than 36 acres of permanently protected grounds surrounding Battery Park as well as programs dedicated to children and adults alike. For instance the Real World Sculpture Park, with darling sculptures kids can climb on.